Another Jumbo Cabinet with National Govt. War of words between President and Rajapaksa over cause of UPFA defeat; CBK wants Tamils also included in National Govt. A nation watched Friday as the victor and the vanquished at Monday’s parliamentary elections pledged to form a National Government just after a historic ceremony, televised live, where Ranil Wickremesinghe took his oaths as the 21st Prime Minister of Sri Lanka. President Sirisena is due to swear in on Tuesday a Cabinet of Ministers representing the United National Party (UNP) and the Sri Lanka Freedom Party (SLFP). Both the sides are engaged in talks on how the ministerial team which will be large in view of a National Government can be resolved. According to talks under way, the Cabinet of Ministers are likely to be 51 – 33 from the UNP led coalition and 18 from the SLFP. The number of deputy ministers is likely to be 40 – 22 from the UNP and 18 from the SLFP. The first ministerial meeting is scheduled for Wednesday. In addition, the Government is to re-introduce the position of District Ministers who will play a key role in development programmes. The system was originally introduced by the late President J.R.Jayewardene. During talks between the UNP and the SLFP chaired by President Sirisena, Premier Wickremesinghe recommended that the first 30 ministers, possibly from the UNP, be sworn in first. This is because Parliament is scheduled to meet only on September 1. Paving the way for this is a ten point Memorandum of Understanding between the two major parties. It was signed by UNP General Secretary Kabir Hashim and the SLFP’s Acting General Secretay Duminda Dissanayake. It sets out the broader objectives of the new alliance including a pledge for constitutional changes. The modalities of the National Government formed the subject of discussion on Friday at a meeting chaired by President Sirisena. Representing the UNP were Premier Wickremesinghe, Chairman Malik Samarawickrema, General Secretary Kabir Hashim and Karu Jayasuriya. The SLFP was represented by Chandrika Bandaranaike Kumaratunga Nimal Siripala de Silva, Acting SLFP General Secretary Duminda Dissanayake, Anura Priyadarshana Yapa, the dismissed SLFP General Secretary, and John Seneviratne. Another meeting has been scheduled for today. That some of the SLFP parliamentarians may rebel against the SLFP-UNP memorandum of Understanding was not lost on Sirisena. He has decided to address the SLFP MPs in groups representing different provinces. The first such meeting will be held today. Sirisena is expected to warn his MPs that they faced expulsion from the party if they did not extend support to the MoU. This is on the grounds that the party’s Central Committee and the parliamentary group had already endorsed it. In what seemed a surprise move, former President Mahinda Rajapaksa, now the UPFA MP for the Kurunegala District, turned up at the brief swearing-in ceremony at the Presidential Secretariat. He walked into what was once the Well of the former Parliament, paid his respects to members of the sangha and took his seat. President Sirisena, after he swore in Wickremesinghe as Premier and watched the two Secretaries sign the MoU, went around greeting those present and seated in the front row. Rajapaksa was one of those whom he clasped hands with — unlike when he refused to do so in November last year at the Elections Commissioner’s office on Nomination Day for the Presidency. A notable absentee on Friday was former President Chandrika Bandaranaike Kumaratunga, who had played a major role in events after Monday’s parliamentary elections. Her seat next to the one Rajapaksa occupied was vacant. There were unconfirmed reports she was protesting that the National Government had to be more “fully representative” of all parties. Kumaratunga who heads a Secretariat for matters relating to reconciliation was of the opinion that there should have also been Tamil representation. She had also been disappointed later that one of her nominees had not been placed on the UPFA National List. 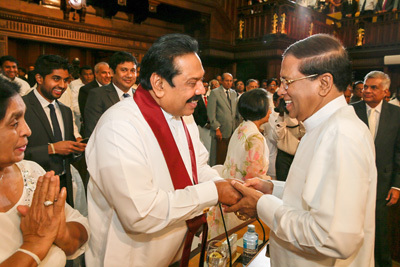 Rajapaksa’s presence at the Presidential Secretariat for the swearing-in ceremony is noteworthy. He rejected requests by his own UPFA partner leaders not to attend. On the night of the elections, he had returned from Kurunegala to his temporary residence in Mirihana in Greater Colombo. There, he watched results on television disturbed frequently by telephone calls. On Wednesday, he telephoned President Sirisena and told him that the UPFA would have won the parliamentary elections if only he (Sirisena) had not helped the UNP. The five-page letter Sirisena had written to him saying he did not wish to make him Prime Minister, Rajapaksa claimed, was one of the causes for the defeat of the UPFA. Sirisena had reacted strongly by giving reasons. He pointed out that five UPFA leaders had spoken disparagingly about him at election rallies. He was in possession of all the details. Among such remarks had been threats and intimidation. They had even declared that they would march Sirisena on the streets without his clothes after they won the elections, the President had remarked angrily. He named three former ministers, a former Provincial Councillor and a Mayor of a local council south of Colombo as being among them. All five persons contested Monday’s elections and won. Sirisena also told Rajapaksa that it was easy for him to work with Prime Minister Ranil Wickremesinghe. Rajapaksa in turn told Sirisena that he would not seek the office of the Leader of the Opposition. Since then, however, he has come under increasing pressure from UPFA parliamentarians. On Wednesday night Rajapaksa met UPFA leaders to take stock of the situation after the polls. He briefed them on his telephone conversation with Sirisena and said they should all support the progressive measures of the Wickremesinghe Government. This was while a handful but influential section in the SLFP failed in a political manoeuvre against a National Government, a move that would have embarrassed President Sirisena. This was by suggesting that the SLFP hierarchy was willing to ensure ten or twelve of their members supported the UNP, giving it a working majority. That group was not going to demand any portfolios and had wanted to deal direct with the UNP. Premier Wickremesinghe was firm in his conviction that he would not allow any such thing. He reminded them that a National Government was a pledge that had been made even during the January 8 presidential election. Yet, Rajapaksa and his faction of MPs, who are opposed to the MoU, will offer unconditional support to Wickremesinghe. Not many were aware that Sirisena’s five-page letter had weeks earlier resonated elsewhere. It was mentioned in these columns last week that the UNP leaders were also disturbed by some of its contents. One was that it gave rise to the notion that the UPFA would win the elections. The other was Sirisena’s assertion that “if the UPFA is not able to reach 113 mark, but comes close to it, I could intervene as the Executive President to obtain the remaining seats to form a Government.” The remarks, it has now come to light, prompted the Tamil National Alliance (TNA) to inform President Sirisena that it would support the UNP in the event the UNP was short of numbers and ensure it was not defeated in Parliament. “This was purely a precautionary measure and things have now played out differently,” said a high ranking source familiar with the matter. 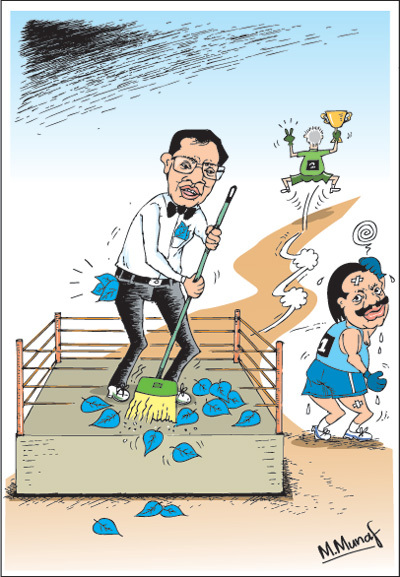 It was also on Wednesday, when the fuller results were known, that Sirisena went into action. He summoned a meeting of the SLFP Central Committee (CC) for Thursday morning at the Presidential Secretariat. On two consecutive occasions earlier, he had through legal counsel obtained restraining orders from the District Court of Colombo to prevent such meetings being held without his presence. His lawyers have submitted a petition to the District Court of Colombo to withdraw the stay order of Premajayantha. Thus, it will not be incumbent on the later to challenge it. Sirisena invited Chandrika Bandaranaike Kumaratunga, who has remained shut out of SLFP meetings for more than a decade, also to take part. He summoned a meeting of the new UPFA parliamentary group at the same venue when the CC meeting was over. There, he made clear, no such group meetings should be held without him being present. That night, then caretaker Premier Wickremesinghe met Sirisena at the latter’s Paget Road residence and handed over a draft copy of the MoU. That set out the UNP’s position. Sirisena was to ask him for time to finalise matters. The SLFP CC also ratified the party’s earlier decision to expel S.B. Navinna, the party’s treasurer who contested Kurunegala District on the UNP ticket and won. However, there was no discussion on the suspension of 13 CC members on election eve or on the suspension on Wednesday of UPFA General Secretary Susil Premajayantha and SLFP General Secretary Yapa. Sirisena met with Premajayantha on Friday to discuss the issue of the UPFA National List. Sources close to the presidency said that the matter was resolved with Premjayantha agreeing to revise the original list he had submitted during nominations in July. That list too had been approved by Sirisena. However, a fresh National List with new names together with a few in the previous list was formulated. It was signed by Prof. Wishwa Warnapala who was named by Sirisena as acting General Secretary of the UPFA. In addition, Premajayantha also endorsed the list with his signature on Friday — a measure mooted by the Commissioner of Elections. The idea behind the former and the present General Secretaries signing was to avoid any legal issues that may arise in the unlikely event of the District Court order restraining Premjayantha from functioning as General Secretary being challenged and overturned. However, both sides have agreed that they would not be contesting issues before court. Together with Premajayantha, the General Secretary of the SLFP too has been suspended. Both also remain suspended from SLFP membership too. Despite Sirisena writing to Elections Commissioner Mahinda Deshapriya, informing him of the suspensions, the polls chief strictly adhered to his previous assertion that he would not recognise such change from the time of nominations until elections were over. The clamour for National List positions from Sirisena has been high. Even former External Affairs Minister, G.L. Peiris called on him last week to make a fervent appeal that his name be allowed to remain in the National List. However, his request was in vain. The names in the previous National List that were allowed to remain are those of A.H.M. Fowzie, Dilan Perera, Faizer Mustapha, Sarath Amunugama and Malith Jayatilleke. The new additions are M.L.A.M. Hisbullah, Mahinda Samarasinghe, S. B. Dissanayake, Thilanga Sumathipala, Lakshman Yapa Abeywardena, Angajan Ramanathan and Vijith Vijithamuni Soysa. In allowing names for the National List, Sirisena has ensured that only those from the SLFP and not the rest of the UPFA coalition partners were accommodated. All the new additions are of those who have lost Monday’s parliamentary elections in different districts, a move that runs counter to good governance (or yahapalanaya) principles. As a result among the names that have been deleted from the original National List to make way for the losers are Tiran Alles, G.L. Peiris, Reginold Cooray, Jeewan Kumaratunga, J. Sri Ranga, and Tissa Attanayake, the former UNP General Secretary who crossed over to the UPFA on the eve of the presidential election. In marked contrast, some of his strongest critics praised Premier Wickremesinghe for his policy of not nominating to the National List candidates who have lost the parliamentary elections. “He should be highly commended for not providing places for those rejected by the people,” said one of them who hurriedly added “we hope he will take similar bold approaches to many other issues.” However, the UNP too appointed H.M. Navavi, who was defeated in the Puttalam District. Wickremsinghe summoned the first parliamentary group meeting of the UNP on Friday at ‘Temple Trees’. He told his MPs that he wanted to ensure they observed strict discipline. He said they should be punctual at official functions and be present in Parliament during question time. He said MPs should not say they were attending weddings or funerals as an excuse when their presence was required in Parliament. “If you cannot follow what I have spelt out, please do not come to Parliament and take your oaths,” he added. Wickremesinghe announced he would propose that Karu Jayasuriya be the Speaker. Whilst focusing on the National List of the UPFA, Sirisena left the issue of the MoU for a National Government formation in the hands of Kumaratunga. On Thursday, the Central Committee decided to name her to chair a committee that would study the draft MoU of the UNP. The CC meeting began with Sirisena giving an overview about moves to form a National Government. Mahinda Samarasinghe who lost at the polls in Kalutara District charged that Mahinda Rajapaksa was taking a communal line and trying to make the SLFP a “Sinhala only party.” Dilan Perera, who served as UPFA spokesperson during the parliamentary elections claimed that both Wickremesinghe and Rajapaksa have been rejected at Monday’s elections. Since the voters had decided that way, it was President Sirisena who should form a National Government in keeping with the mandate he received. Kumar Welgama, newly re-elected UPFA MP for Kalutara District declared he was opposed to the formation of a National Government. He requested that he be allowed to remain and function as “an independent” within the UPFA. On Friday evening, Sirisena removed him from the Central Committee. Former Minister T.B. Ekanayake was also removed from the CC yesterday. Concurring with Welgama were Dullas Allahapperuma (UPFA – Matara District) and Pavithra Wanniaratchchi (UPFA – Ratnapura District). Allahapperuma said people had not given a mandate for the formation of a National Government. Wanniaratchchi declared the move for a National Government was not acceptable. Sarath Amunugama and S.B. Dissanayake also spoke. The CC endorsed the setting up of a National Government and decided it should be placed before the parliamentary group meeting that was to follow. There Sirisena explained details including how a MoU was being signed between the UNP and the SLFP for a National Government for two years. Allahapperuma was to appeal to Sirisena to wind up the Financial Crimes Investigation Division (FCID). S.B. Dissanayake expressed the view that Finance and Education portfolios should be held by SLFP ministers. Sirisena, however, maintained stoic silence. The Kumaratunga Committee tasked to study the UNP’s draft Memorandum of Understanding met at the BMICH on Thursday. Some members asked that an assurance be given that there would be no privatisation of state ventures. Kumaratunga, however, said that she was in favour of it. She pointed out how SriLankan Airlines was allowed to collaborate with the Dubai-based Emirates Airlines when she was President. At that time professional expertise was available. However, under former President Rajapaksa this state venture has been ruined, she said. There were also calls that the MoU should have an express provision that there would be no political victimisation. However, no such provisions were included in the MoU. Details of the MoU appear elsewhere in this newspaper together with reports on the outcome of Monday’s elections. The UNP won 106 seats while the UPFA won 95 in the 225 seat Parliament. The third place went to the Tamil National Alliance (TNA) which won 16 seats. It contested as the Ilankai Thamil Arasu Katchi (ITAK) or the Ceylon Federal Party in the North and East. The Janatha Vimukthi Peramuna (JVP) won only six seats and one went to the Sri Lanka Muslim Congress (SLMC) from the east where it contested on its own. In others the SLMC fielded candidates on the UNP ticket. The Eelam People’s Democratic Party (EPDP) won one seat in the Jaffna District. Of the votes polled, the UNP secured 45.66 percent, the UPFA 42.38 percent and the Tamil National Alliance 4.62. There is a difference of one million votes between what Rajapaksa obtained in January’s presidential poll and the UPFA on August 17. Mahinda Rajapaksa polled 5,768,090 at the 2015 Presidential election. This time the UPFA gained 4,732,664 votes. No sooner the final outcome of the elections became clear, Wickremesinghe declared on Wednesday; “I am inviting all political parties to work together by reaching consensus to continue good governance.” He told a news conference at ‘Temple Trees’ that the people had endorsed good governance policies when they voted at the Presidential election on January 8. “We will not go back to divisive politics,” he asserted. The same day, however, more than 50 newly elected MPs of the UPFA gathered at the official residence of the former Western Province Chief Minister Prasanna Ranatunga. This was ahead of the parliamentary group meeting summoned by President Sirisena. Ranatunga has been elected as an UPFA MP from the Gampaha District. UPFA sources said their former General Secretary Premajayantha was not in favour of this meeting on the grounds that it would be confrontational vis-à-vis President Sirisena. Sirisena has already directed that investigations begun by different investigating agencies of the Police be continued. Most of the new investigations are being handled by the Financial Crimes Investigation Division (FCID) headed by Senior DIG, Ravi Waidyalankara, who is also a lawyer. Other investigations are being conducted by the Criminal Investigation Department (CID) or the Commission to Investigate Bribery or Corruption (CIABOC). The CIABOC is to be re-constituted soon after the Constitutional Council (under 19A) is established. The DIG has already been informed that his name would be proposed. Some arrests in important investigations are likely in the next few days, according to Police sources. As always, there were winners and losers at Monday’s parliamentary elections. There were also a few heroes. The topmost is Elections Commissioner Mahinda Deshapriya who had the courage and conviction to be tough and impartial in dealing with those who broke elections law. Thus, a free and fair election was possible. Another is Police Chief N.K. Illangakoon and his personnel who ensured the smoother conduct of an election with few incidents by ably carrying out directives. It behoves the Government to tighten election laws further and more importantly ensure Police personnel, particularly the lower rungs, are better rewarded than the pittance of a few hundred rupees they receive now for polls duty. They have made a worthy sacrifice and deserve a reward. COLOMBO DISTRICT: Almost a reverse of the 2010 parliamentary elections. This time the UNP secured 53 per cent as against 36.1 percent in 2010. The UPFA obtained 39.2 percent of the votes as against the 53 percent. The UNP returned 11 members and the UPFA seven. In 2010, the UPFA won 10 seats and seven this time. The JVP suffered a setback compared to the 2010 elections. It gained only 6.73 percent of the vote as against 11.78 in 2010 when it contested under the Democratic National Alliance. It won two seats then and one this time. It was virtual marching orders out of politics for Sri Lanka’s highest decorated soldier, Field Marshal Sarath Fonseka, who was a presidential candidate in 2010. His Democratic Party recorded a measly 0.43 per or 5,238 votes almost the same as just four full strength battalions. Rosy Senanayake, State Minister for Child Development in the caretaker cabinet and vocal proponent for greater women’s representation in Parliament, lost. She is being tipped for a diplomatic appointment in Europe. UNP leader Ranil Wickremesinghe won the highest number of preferential votes obtaining more than half a million. GAMPAHA DISTRICT: At the January Presidential election, a combination of parties that backed President Sirisena won only by 4,660 votes. At Monday’s elections the UNP, contesting on its own, had a majority of 27,046 votes. The UPFA gained 63.37 percent of the votes in 2010. It was reduced to 44.92 percent this time. The UNP which had only 28.65 percent of the vote in 2010 increased its vote base to 47.13 percent. The JVP retained its 2010 vote base getting above seven percent as in 2010. The Democratic Party was routed obtaining only 0.38 percent of the vote. Leading the DP’s list of candidates was Anoma Fonseka, wife of Field Marshal Fonseka. The UNP’s victory in the district came despite only winning in five of the electorates — Wattala, Negombo, Katana, Ja-Ela and Kelaniya. Except in Kelaniya, all other electorates have a strong Christian/Catholic vote base. Losing this time was Joseph Michael Perera, a former Speaker and former MP for Ja-Ela. Though the electorate was won, he lost the District vote. The UPFA won in Divulaptiya, Mirigama, Attanagalla, Minuwangoda, Gampaha, Mahara, Dompe and Biyagama. KALUTARA DISTRICT: The UPFA gained only 48.56 percent, but still won the district by 28,567 votes. It won 63.68 percent of the votes in 2010. In contrast, the UNP which gained only 28.32 percent in 2010 received 44.47 this time. The UNP increased the number of MPs from two to four. The UPFA’s members dropped from seven to five. The JVP which contested under the DNA in 2010 gained 7.45 percent. It had one seat. This time it retained this seat in what was a poor performance with its number of votes being reduced to 5.52 percent. KANDY DISTRICT: Compared to 2010, the UNP made substantial gains. From 34.48 percent it increased its vote base to 55.57 percent, thereby regaining power in its traditional stronghold. The UPFA in contrast, fell from 60.77 percent to 55.57 percent. Thus it only won five seats as against eight previously. The UNP won all electorates in the Kandy district, except Udu Dumbara. The UNP also increased its victory margins in most of the electorates (Galagedara from 31.1 percent to 50.87 percent, Harispattuwa 37.6 percent to 56.7 percent, Patha Dumbara from 38.65 percent to 59.5 percent, Teldeniya 33.71 percent to 52 percent, Hewaheta from 33.71 percent to 58.55 percent among others). The JVP received only 3.87 of the vote — a marginal drop from 4.24 percent in 2010. MATALE DISTRICT: UPFA votes decreased to 45.54 percent as against 66.96 percent in 2010. It won only two seats as against four the last time. The UNP votes increased from 28.47 percent to 49.84 percent and it won three seats. NUWARA ELIYA: UNP votes increased by 22 percent this time whilst the UPFA votes dropped by 18 percent. The UNP increased its number of seats from two to five. GALLE DISTRICT: The UPFA won in nine of the 10 electorates. However, its vote base was reduced by 16 percent compared to the 2010 elections. The UNP increased its vote base from 26 percent in 2010 to 42 per cent. This showed that the UNP votes did not come only from the minority community. MATARA DISTRICT: The UPFA won the district but its votes were reduced by 13 percent compared to 2010. The UNP increased its votes by about 12 percent. JVP stalwart Sunil Handunnetti lost. He has been appointed on the JVP National List together with Sarath Chandra Mayadunne. The JVP, however, made a gain from 6.25 percent in 2010 to 7.38 per cent. HAMBANTOTA DISTRICT: A salient feature was the high turnout of 81 percent. A 10 percent drop in the UPFA vote was recorded. Its increase in votes was only three percent. Nirupama Rajapaksa, a member of the Rajapaksa clan, lost. Though he did not taken part in the national election campaign for his party, UNP deputy leader Sajith Premadasa failed to substantially increase his party’s vote base. It rose by 5.6 percent or to 35.65 percent as against the previous 29.86 per cent. KURUNEGALA DISTRICT: The district was a focal point as former President Rajapaksa was contesting. The UPFA’s vote base dropped by 14 percent compared to the 2010 elections. It was then 63.84 percent. Its number of seats was reduced from ten to seven. The UNP seats increased from five to eight. Rajapaksa obtained 423,529 preference votes. UNP District leader Akila Viraj Kariyawasam secured 286,155 preference votes. The UPFA secured victories in 11 of the 14 electorates ceding three to the UNP. PUTTALAM DISTRICT: The UNP increased its number of seats to five from the previous two. The UPFA tally dropped from six to three seats. The UNP also increased its vote base by 20 percent while the UPFA’s dropped by 22 percent. The difference was as high as 46 percent – the UPFA 19 percent and the UNP 66 percent. The UPFA gained 56 percent of the vote last time, but there was a 36 percent drop this time. BADULLA DISTRICT: The credit for the UNP’s victory should go to Harin Fernando who won 200,806 preference votes. The UNP’s seats increased from two to five though the party won all nine electorates from where it got 258,844 votes. The UPFA majority dropped from 58 percent to 38 percent. The UNP increased its vote base from 32 percent to 54 percent compared to 2010. The UPFA won though its majority was lowered. In 2010 the UPFA gained 75 percent of the vote, but this was reduced to 52 percent while the UNP vote increased from 18 percent in 2010 to 41 percent this time. ANURADHAPURA DISTRICT: A closely fought campaign led to a difference of a mere 16,784 votes. The UPFA won five seats and the UNP four. In most of the electorates too, there were close competition. In Medawachchiya, the vote difference was only 2,524 votes in favour of the UPFA; in Horowpathana the difference was only 997 votes for the UNP, in Mihintale it was a difference of a paltry 2,120 in favour of the UPFA and in Kekirawa it was even less — 791 vote being the difference in favour of the UNP. However in the Kalawewa electorate the difference was 10,000 votes in favour of the UPFA. POLONNARUWA DISTRICT: The home base of President Maithripala Sirisena was won by the UNP. It gained 50 percent of the vote while the UPFA ended with 43.6 per cent. At the 2010 parliamentary elections, the UPFA gained nearly 70 percent of the vote while the UNP had only 26.6 percent. The JVP increased its vote from 3.77 percent to 5.71 at this election. RATNAPURA DISTRICT: The UPFA gained 51 percent of the vote as against 45 percent for the UNP. However, the UNP seats increased from three to five and the UPFA dropped from seven to six. In 2010, the Ratnapura district had ten seats. It has now been increased to 11. A murder suspect in remand custody obtained the highest number of preference votes in the District. KEGALLE DISTRICT: The UNP won the district with a margin of 20,259 votes or a thin margin of four percent. As a result it secured a bonus seat and won five seats as against the two it previously held. The UPFA seats dropped from seven to four. The JVP’s vote base was almost the same it had in 2010. Voting patterns in the Northern and Eastern Provinces show that support for the UPFA has eroded sharply when compared to the parliamentary elections in 2010. In contrast, the UNP had increased its vote base. The TNA which contested under the Ilankai Thamil Arasu Katchi (ITAK) since it is yet to register itself held on to most of its seats in the two provinces. JAFFNA DISTRICT: In the Jaffna district, the ITAK managed to hold onto the five seats it won in 2010. The EPDP and the UNP won one each. If the TNA’s manifesto had sought a federal system and a merged northern and eastern provinces within a united Sri Lanka, others whose campaigns were more focused on appealing to hardline sentiments fuelled by the hardline Tamil Diaspora failed to evoke a majority vote. Yet, there is a strong message in this for the National Government. The nine seats here were reduced to seven by the Department of Elections after the population census. WANNI DISTRICT: The TNA (ITAK) won four seats while the UNP and the UPFA won one each. In 2010 the ITAK won three seats while the UPFA won two and the UNP one. BATTICALOA DISTRICT: The TNA retained the three seats it won in 2010. It won over 53 percent of the votes. The UPFA won one seat in 2010 but did not win a seat this time. The SLMC also retained a single seat which it had also won in 2010. The UNP won one seat. DIGAMADULLA DISTRICT: The UNP secured over 46 percent of the vote and gained four seats. The UPFA won two and the TNA (ITAK) one. In 2010, the UPFA won four seats, the UNP two and the TNA (ITAK) one. Sarath Weerasekera, a former Navy officer lost. TRINCOMALEE DISTRICT: The UNP secured over 46 percent of the votes winning two seats. The TNA (ITAK) won one and the UPFA one. In 2010, the UPFA won two seats. Ranil’s time: It’s 4 p.m. Finally loosening the grip of the ‘Satakaya’?